As we move into Jazz Appreciation Month, the Meridian Center for Cultural Diplomacy (MCCD) celebrates the unifying power of music through Jam Session: America’s Jazz Ambassadors Embrace the World. After runs in Africa, East Asia and the Pacific, the Middle East, South Asia and Latin America, Jam Session is on view at the U.S. Diplomacy Center now through May 18. 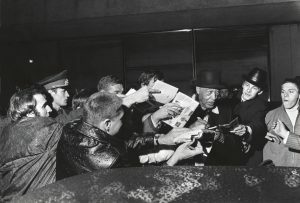 Duke Ellington signing autographs in the rain, Moscow 1971. Courtesy of the Duke Ellington Collection, Archives Center, National Museum of American History, Smithsonian Institution. Jazz Diplomacy was born in 1956 when Congressman Adam Clayton Powell Jr. proposed that Dizzy Gillespie form a jazz ensemble to represent the U.S. abroad. Competition between the Soviet Union and the United States was increasing, and these musical envoys created an opportunity to communicate the democratic values and sensibilities of the U.S. through a universal language—music. Supported by the State Department and Eisenhower Administration, the group toured Southern Europe and the Middle East that same year. 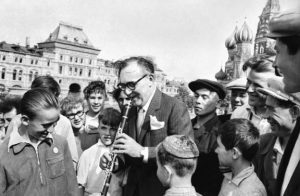 Benny Goodman performs for a young audience in Red Square, Moscow 1962. Courtesy of the Irving S. Gilmore Music Library, Benny Goodman Papers, Yale University. The initiative was a tremendous success and continued until 1978, sending many of the Jazz greats on international tours. Benny Goodman toured East Asia and the Soviet Union with his band. Louis Armstrong and the All Stars traveled across Africa. The Duke Ellington Orchestra went to the Middle East and South Asia. Talented artists including the Dave Brubeck Quartet, Miles Davis, Earl Hines, Oscar Peterson, Clark Terry and Sarah Vaughan all toured the world on America’s behalf. Jam Session honors the service of these musicians, exploring the program’s contributions to U.S. cultural diplomacy by following their journeys through political instability, illness and exhausting travel. Today, the legacy of Jazz Diplomacy is clear as artists continue building bridges across cultures through musical collaboration and creation. 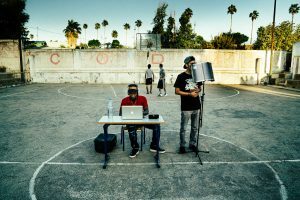 The Next Level program, for example, connects hip hop MCs, DJs, beat makers, graffiti artists and dancers from the US and abroad to promote understanding, conflict resolution and professional development through workshops, jam sessions and performance. Recent delegations from the US have traveled to Azerbaijan, Cambodia, Egypt, Morocco and Myanmar. Up next, alums from each of these countries will gather stateside for Next Level Global! Keep an eye on Facebook and Instagram for news and updates. POST TAGS: Jam Sessions, Jazz, Next Level.